Officials at the awards ceremony. 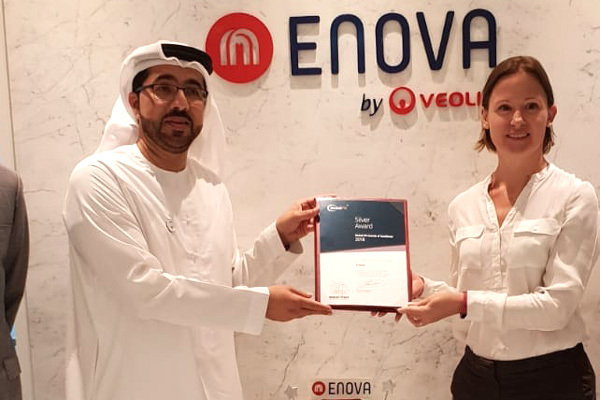 Enova, a smart integrated energy and facilities management solutions company, has won a Silver Award at the Middle East Facility Management Association (Mefma) gala event held recently in Dubai, UAE. Enova is a founding member of Mefma, a non-profit association that provides a dedicated platform for FM professionals, wider construction industry stakeholders, and owner associations. The Silver Award at the recently concluded Global FM Awards 2018 was in recognition of its excellent performance and key contributions to the FM industry, particularly its exceptional business processes and procedures, said a statement from Enova. The company pointed out that it was at the forefront of digital transformation in the Middle East’s FM industry through its network of complementary smart tools and cutting-edge technology as well as its use of big data analytics. Organised by the Global Facility Management Association, the awards celebrates and acknowledges outstanding best FM practices across the globe. These awards aims to raise the profile of the FM profession, expand the industry’s influence, and promote the health, safety, productivity, and well-being of people who utilise the built environment, it said. Besides Enova, two other Mefma members, QBG and Emrill, were shortlisted for this year’s awards. Lauding Enova, Jamal Lootah, the president of Mefma, said: "We are proud of the company’s accomplishment and its contributions to advance and raise the global competitiveness of the regional FM by adopting the best practices and globally recognised FM standards." “The award not only reflects its commitment to deliver excellent FM services, but also shows the world-class standards that we follow across the entire Middle East region,” stated Lootah. The panel of judges for this year’s awards comprised Ali Alsuwaidi, Andy Kelly, Bill Ward, Carolyn McGary, Jozsef Czerny, Stephen Ballesty, Stuart Bryant, and Thiago Santana. Winners were announced during the World FM Day celebration held today (May 16). The World FM Day, initiated by Global FM, provides an opportunity for global knowledge and expertise sharing. It encourages discussions to promote the FM profession and celebrate industry successes.